Turn-of-the-century construction methodology in a 1903 tenement building is celebrated in the combination of two one-bedroom apartments by exposing brick walls, ceiling beams and wooden studs which were hidden beneath layers of paint, plaster and lathe. 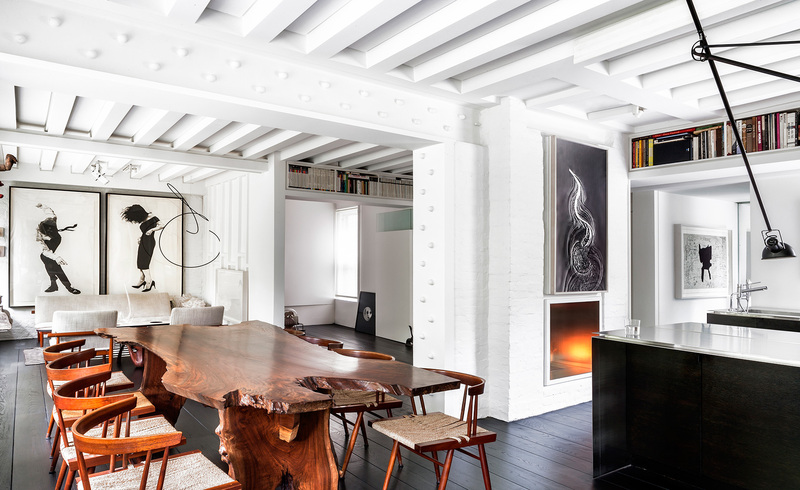 White walls and ceilings lend a minimalist unity to the rough charm of coarse and quirky construction elements—bricks, beams and studs are uneven, irregular and rarely truly square. Although all interior walls were demolished the configuration of the ceiling beams retains the memory of the apartments’ original floor plans. Beneath this architectural framework, open space unfurls: a fifty-foot long living dining/area stretches the width of the apartment’s eight windows; a stainless steel fireplace opens on two sides; bathroom and bedroom doors disappear by sliding or folding flat into walls. In the open plan master bathroom, a custom-designed stainless steel/resin sink evokes a shimmering pool of water. To expand spatial volume, kitchen appliances and storage spaces are below counter or built into the walls, while custom-designed bookcases float just above the floor or beneath the ceiling. Outside each of the apartment’s fourteen windows, planters with evergreens and ivy create a lush extension to the exterior. As a dialogue with modern furnishings by George Nakashima, Finn Juhl, Paul McCobb and Paul Lazlo, Aharoni designed a stainless steel and oak kitchen island, a travertine and blackened steel coffee table and co-designed an eleven foot black walnut dining table with Hisao Hanafusa. Curating artifacts from India, Africa and Europe with contemporary sculpture and art creates moments of visual and textural intimacy with the apartment’s junctures and horizontal planes.